First a new liver and now a new baby! Yupp, that’s it, Robin’s preggers. Haha . Noooooo, not really. But we do have a new baby, in a way. We now have a four month old miniature schnauzer puppy. We got her yesterday as a gift from my sisters. I am a happy man. Right now she’s in her normal position, which is on my lap sleeping away. She’s already very attached me and follows me from room to room. I’m a dog guy. I’ve always been a dog guy. In fact I’ve had dogs since I was probably 15 months old. Dogs are simply awesome. Cats lie around plotting how they might kill you while dogs can’t wait for you to get home. There’s no guarantee that anybody’s going to be be excited to see me, ever. In fact, I can come back from getting the mail and no one notices. But my dog? My dog always goes absolutely bonkers! Dogs are great medicine too. To prove my point, I’d like you to know that they had therapy dogs that visited in the hospital. No therapy cats. My liver transplant team told me there are certain pets that I shouldn’t have after liver transplant. You want to guess what they were? One of them was cats! And then birds and reptiles too. They told me they carry germs and that my immuno suppressants would cause me to be more susceptible to them. My little puppy pom-pom, a gift from my sisters, makes me feel better already. Plus she makes me exercise a heck of a lot more than I was before. I do admit that I’m pretty tired though. Last night, her first night with us, she did not want to go in her crate. We’ve had puppies before and have always crate trained them. We’re tough! We’re ready for the crying. But she howled for an hour and a half! Even a heartless man couldn’t stand that. So I got up with her at about 1:30 or 2:00 and calmed her down. We went for a late night walk around our neighborhood, had a little snack together, and then snuggled for a while on the couch. Then, I put her crate right next to the couch, put my hand into the top and massaged her until she fell asleep. She woke up at about 4:00 and then spent from 4 to 8 snuggling with me and sleeping together on the couch. So I’m a little bit tired today. Picking a name was interesting. I decided to call her “Pom Pom.” I wanted a name that would remind me of the occasion that brought her into my life. My son and donor Joshua’s surgeon was Dr. POMfret and mine was Dr. POMpaselli. Pom-pom just made sense. Plus she’s really fluffy like a pom-pom. Think it’s important, after transplant, to have goals that get you up and moving. I needed a serious push. Let’s face it, we’d all rather lie on the couch then get up and walk when we’re not feeling well. My new puppy doesn’t understand liver transplants. When she wants to go out, we go out. I’ve not been able to have a dog because I’ve been too ill. Pom-pom is reminding me to put those days behind me and concentrate on my new future. 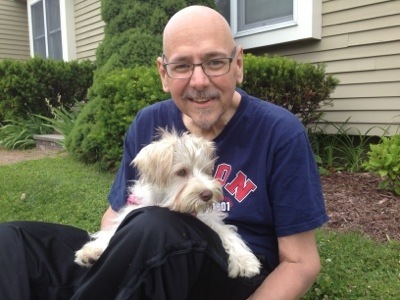 This entry was posted in chronic illness, End Stage Liver Disease, facing death, Fatty liver, Fatty Liver Disease, Lahey Clinic, Liver disease, NASH, organ donation, Organ transplant, transplant and tagged Liver disease, recovery, therapy dogs, transplant. Bookmark the permalink. 2 Responses to First a new liver and now a new baby! I know you’re not a cat person but my cats know when I am having a bad day and snuggle with me. They also meet me at the door when I come home. And when it’s time to play, I had better be available or I get the claw on my leg telling me to pay attention! I love my cats like you love your dogs. I am so grateful that you have found your “soulmate” in your new puppy. There is NOTHING like the healing therapy that an animal gives. The unconditional love is overwhelming at times. My councelor has a dog in her office and I cannot commence the session until I have had my 5 minutes of wrestling with Cookie. Cookie also knows when I am struggling and forgoes the wrestling for snuggles and kisses. Animals are just the best therapy around. I am soooooo happy for you. Your recovery time will definately be cut in half! AND you now have a friend for life! God continues to bless you and I continue to pray for you and your family and now I will include Pompom. So happy for you. Dogs are indeed good medicine.